the idea was simple enough, take the obviously corroded floppy disk that came from a Roland HP-1900 and grab all the useful parts from it. the floppy disk drive is a simple device. it uses a stepper motor to position a read/write head that moves across a spinning disc made of mylar powered by a unique motor. from a personal computer point of view there there only 3 sizes of floppy disk in common use: 8″, 5.25″ and 3.5″. smaller sized floppy disks emerged late in the game which got used for things like music players and cameras. but these formats never found a foot hold in computing. almost everything about a floppy disk is the same no matter how large they were. disks use physical detections for practically everything: read/write capable, track zero detection, and sometimes sector position. you can see how easily a drive could become “out of alignment” making media impossible to read in other drives. 3.5″ drives had density detectors. 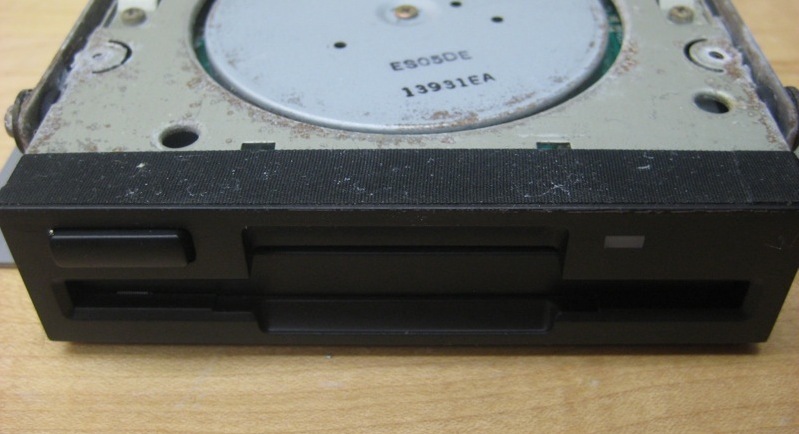 this meant the floppy inside the drive defined how it was read. I didn’t want to just recycle the floppy even though there were signs that it would never work again. opening it up to take it completely apart proved to be a challenge. let’s just say that it’s been a while since a floppy has been under the knife. the case is actually a snap to open if you start with the tape around the bezel. if you remove that the case starts to slide apart. needless to say, that bit was forgotten and after it was pried apart I remembered the tape. once inside it was quick work to get it completely into pieces. I powered up the soldering iron but I shouldn’t have bothered. the cable connector and the configuration pin block were too short to remount. but I saved the LED and the pin switches, the IR stop switch and the stepper motor. but the real treasure is the pictures. the 3.5″ floppy has a lot of parts. compared to a 3.5″ hard drive it’s a very complicated device. it’s no wonder they used to sell for $500 a piece.